SEOUL, Jan. 23 (Yonhap) -- South Korea plans to conduct an artificial rain experiment over the Yellow Sea later this week to analyze the method's effect on reducing fine dust pollution, government officials said Wednesday. The rare experiment is to be jointly carried out by the National Institute of Meteorological Research (NIMR) and the National Institute of Environmental Research (NIER) over the sea between the Korean Peninsula and China on Friday. 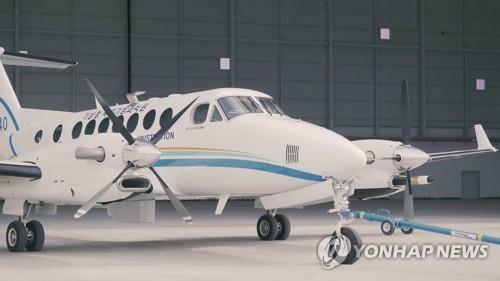 An airplane owned by the Korea Meteorological Administration (KMA) will disperse silver iodide into the clouds while flying at a speed of over 350 km per hour near Deokjeok Island, which belongs to Ongjin County in Incheon Metropolitan City. The substance is known to increase precipitation by collecting water vapor. Researchers from the NIMR and the NIER plan to utilize ships and various devices to observe changes in precipitation particles in the cloud and effects in reducing fine dust concentrations after the chemical is sprayed. Details of the time and location of the experiment may change depending on weather conditions, the officials said. South Korea previously conducted similar experiments in inland areas but with little success. It will be the first time it has been tried in the Yellow Sea. The NIMR is an affiliate of the KMA and the NIER is affiliated with the Ministry of Environment. If successful, the government expects the planned experiment to help efforts to reduce the density of fine dust particles blowing toward Korea from China. The effect of artificial precipitation on reducing fine dust has yet to be verified worldwide. "China and Thailand have previously attempted to lessen fine dust density by means of artificial precipitation, but an official report of success has not been released yet," said a KMA official. At a Cabinet meeting Tuesday, President Moon Jae-in expressed concern about rising fine dust pollution and called for various countermeasures, including artificial precipitation and the installation of dust collectors. "The presidential office Cheong Wa Dae has recently instructed the KMA and the Ministry of Environment to consider conducting an artificial rain experiment," a government official said.